Homi Bhabha Centre for Science Education (HBCSE) is a constituent unit of the Tata Institute of Fundamental Research (TIFR), founded in 1974 by two TIFR scientists, V. G. Kulkarni and B. M. Udgaonkar. It began with the aim of improving science education at the school level in the country, for which it received its initial funding from the Dorabjee Tata Trust. Afterwards, based on the performance of the projects undertaken in the first few decades, the Department of Atomic Energy (DAE) provided space and funds to build a separate campus for HBCSE. In its initial years, HBCSE functioned out of a Bombay Municipal Corporation (BMC) school of Nana Chowk, Mumbai. In October 1992, the centre shifted to its new building at Anushaktinagar, Mumbai. Since the last four decades, HBCSE has been conducting activities which can be categorized as Research in Science, Technology and Mathematics Education (STME), Teacher Professional Development, Material Development, Science Popularization and Olympiads in Science & Mathematics. The scope of these activities ranges from research in STME to improving STME based on the research findings, conducting orientation programs/workshops to interact with teachers and students, developing textbooks and other co-and extra-curricular material in science and mathematics at the school level, and selection/training of young students to participate in International Olympiad Programmes. In its early days, HBCSE conducted projects for teachers as well as for students from BMC schools, where the medium of instruction is Marathi. These projects were aimed at strengthening the pedagogical knowledge of teachers in science and mathematics and improving teacher-pupil interactions. Some projects were also aimed at enhancing students’ engagement in science, developing co-curricular materials, and designing low-cost experiments and activities for science and mathematics education in Marathi. Since then, HBCSE has worked in collaboration with the education department of Govt. of Maharashtra and conducted various educational projects to improve teaching-learning processes in the classroom. Some of these past projects include the BMC Project, SC/ST Project, The Language Project, Non-Formal Education Project, Solapur Project, Ashram School Project (Residential schools runs for tribal children), Sarva Shiksha Abhiyaan, etc. All of these projects provided HBCSE with field-based experience and helped it develop tools and educational material for STME. After the devastating earthquake in Latur district in 1993, HBCSE took the responsibility of assembling a low-cost experimental kit and distributing it to 40 schools in earthquake-affected areas of Latur. Currently, for the majority of projects, HBCSE uses English, Hindi and Marathi as a medium of interaction in science education. In this article, I shall describe a few past and ongoing projects and resources developed at HBSCE in the Marathi language. While interacting with school children, educators from HBCSE realized that if encouraged, children ask many interesting questions. Thus, an activity named ‘Shanka Samadhan’ was initiated in Dec 1974 in which children would send questions on a postcard to HBCSE and educators from HBCSE would respond personally to the child. This initiative received an enthusiastic response from the children and these questions-answer pairs were published under a feature ‘Shanka Samadhan’ in Kishore, a magazine published by Balbharati, Pune. Shanka Samadhan appeared for nearly 25 years in Kishore. Every child observes nature and is curious about it from a very young age. Diagnosing Learning in Primary Science (DLIPS), a project undertaken by HBCSE during 1993-96, sought to understand children’s spontaneous conceptions about nature. Students from grade 5 and 6 from two tribal schools (ashramshalas) and one urban school were involved in this project. From the interactions with the students, researchers from HBCSE observed that there was a clear mismatch between students’ understanding and concepts mentioned in textbooks. For example, many children found it difficult to distinguish between living and non-living things. According to them, the sun, the moon, clouds, and water were ‘living’. The students identified seeds as ‘non-living’, but were aware that they would become ‘living’ when sown into the soil. Tribal children possess a rich knowledge of flowering and fruiting trees, medicinal herbs, use of plants in food and construction, wild animals, etc. Compared to what’s in their textbooks, everyday observation and use of plants have a greater influence on these students. The students also drew beautiful and realistic pictures of animals with remarkable attention to fine details. When asked to draw a context map of living and non-living things from a forest, one child drew an amazingly detailed map. The DLIPS project report is available online in Marathi and English for teachers/educators on HBCSE website. The report suggests activities for teaching and provides pointers for discussion on everyday observations from nature. HBCSE has published a large number of curricular and popular science books for propagating STME among school children as well as for general readers. These include Halke - Phulke Vidnyan (Small Science),Stri-Purush Bhed ani Vidnyan (Gender and Science), Ganitachya Gujgoshti, Aapli Suryamala (Our solar system) and Kutuhal (How and Why) series among many others. One of HBCSE’s best-known publications is the curricular book series, Small Science for primary school level, which was developed after years of research, analysis and field trials and introduced as a science curriculum for grades 1-5. These innovative books aim to develop observation, language (oral and written), design, creativity and quantitative skills of children. The series includes a textbook, a workbook and a teachers’ handbook. 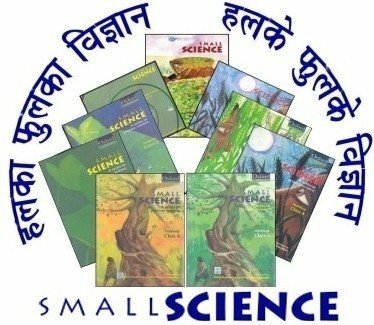 Small Science books were originally written in English and then translated into languages like Marathi, Hindi and Urdu. In these books, researchers have used child-friendly language and illustrations that can attract children’s attention. Several teachers have adopted this curriculum in their schools and have provided strongly positive feedback. Small Science books in all four languages are available on HBCSE website and can be downloaded freely. The hard copies of all HBCSE publications are also available for sale. 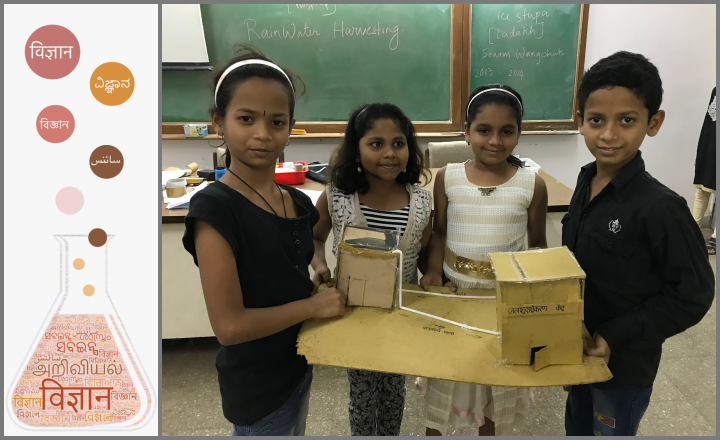 Currently, HBCSE is running a longitudinal project called School Science Research and Development - Participatory Action Research (SSRD-PAR) for students of a nearby Marathi-medium school. ‘Participatory Action Research’ implies that the improvement of a community is the primary goal rather than furthering the research interests of academics. In this project, HBCSE members are working in collaboration with science teachers. This project started in 2015 with a division of grade 3. Since then, HBCSE has been designing lesson plans, low-cost experiments and worksheets for children who are currently in grade 6. A part of this project is a summer camp where 15-20 students of the participating school (currently, grade 6) visit HBCSE for a period of one month and engage in activities involving creativity, outdoor engagement and design which may not be a part of their regular curriculum. In the summer camp, children enjoy composing poems, stories, making stop-motion animation videos, making their own compost, and more. The summer camp also provides HBCSE members with an opportunity to try a particular lesson plan with fewer children before it is implemented in a bigger classroom of about 70 children. The lesson plans, worksheets are designed in collaboration with the science teachers. The project has seen an upsurge in children’s participation and classroom interaction, especially when environmental aspects are discussed. The children and parents from other classes, which are not involved in the project, have shown a keen interest in using lesson plans, worksheets and activities developed in this project. These lesson plans, activities and worksheets are currently being compiled to design a teachers’ handbook in environmental science for grades 3-5 on the basis of Maharashtra State board syllabus (Parisar Abhyas). This booklet covers a wide range of themes, for e.g. food, water, our surroundings, family and values, human body, etc. HBCSE members feel that they can enhance the interaction among children and teachers using this constructivist approach in environmental science education across the state. 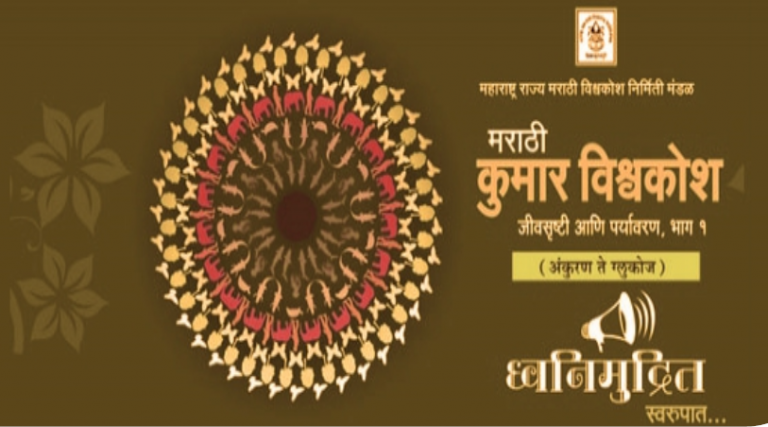 Recently, HBCSE and Maharashtra Rajya Vishwakosh Nirmiti Mandal worked in collaboration to design and produce a junior encyclopedia called Kumar Vishwakosh (volume 3) of Jeevasrushti Ani Paryavaran (Biology and Environment). This volume of Kumar Vishwakosh is freely available online. This encyclopedia explores concepts normally taught in grades 9 -12. A team of HBCSE members and several teachers from Maharashtra have worked on this project since 2007. There will be about 1,100 entries in this encyclopedia and it will be published in four volumes. The descriptions in the encyclopedia are presented in simple and lucid language. All entries are accompanied by vivid colourful pictures and photographs. As an approach towards inclusive education, this encyclopedia is also printed in Braille and is available in audio format. At HBCSE, while sometimes the material has been produced in Marathi and then translated into English, at other times, it has been the other way around. The number of books sold as well as the viewership of the website suggests that these efforts have a large reach. Thus, HBCSE takes a synergistic approach towards material development and language to improve STME and enable its spread far and wide. Did you enjoy this article? Please let us know in the comments below.